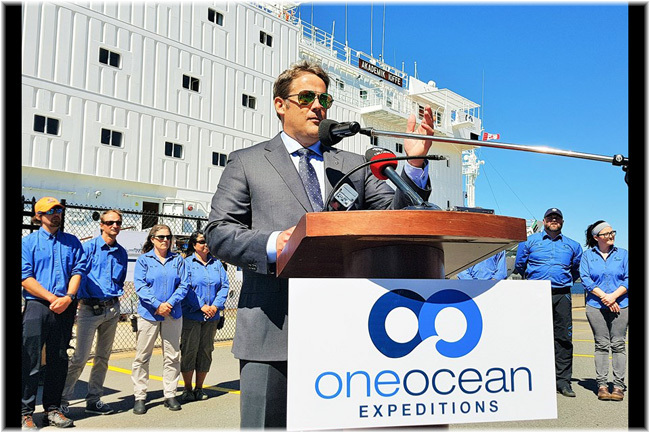 Last week, Canadian-based One Ocean Expeditions announced the acquisition of a third ship for its expedition fleet, while indicating that it would probably be doing more business in non-polar regions as well as in the Nova Scotia port of Sydney. Meanwhile, the Baltic shipyard MV Werften has delivered the first vessel under its new ownership by Genting Group of Hong Kong. 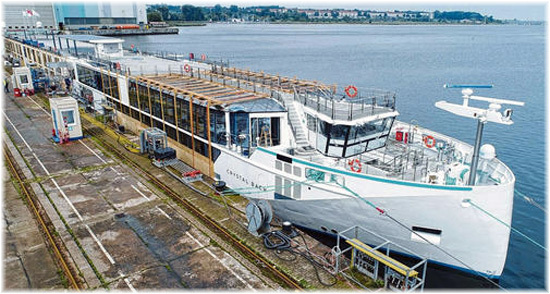 The 106-berth Crystal Bach, which will cruise the Rhine, Main and Danube, will be the second ship in the Crystal River Cruises fleet, following the 154-berth Crystal Mozart on the Danube. Finally, Thomson Cruises have confirmed that they will base their 1,830-berth TUI Discovery at Newcastle-upon-Tyne in 2018. One Ocean Expeditions, which is based in Squamish BC, near Vancouver and on the Whistler and Jasper route of the Rocky Mountaineer train trips, is now in its tenth year of operation. Last Monday, it announced that it was about to acquire a third ship that it would name RCGS Resolute. One Ocean founder and managing director Andrew Prossin took advantage of a visit by its 96-berth Akademik Ioffe to Sydney, Nova Scotia, to make this announcement, as well as to give details of a number of other expansions to One Ocean’s operations. The 146-berth RCGS Resolute will join the Akademik Ioffe and the 92-berth Akademik Sergey Vavilov in November 2018, when she will commence a long-term charter with options until 2028. Presently operating as Hapag-Lloyd’s 184-berth Hanseatic, she is the only five-star rated expedition cruise ship now in service. One Ocean plan to reduce her capacity by about 20%, which will give her a very high Passenger Space ratio of 57.4 cubic feet per gross ton of measure, which when combined with the company’s usual personalised service, is planned to be a winner in the expedition flield. With large indoor and outdoor viewing areas and exceptional maneuverability, RCGS Resolute is ideally equipped to cruise the world’s most pristine regions. She is capable of cruising for eight weeks without refueling and has an operating range of 8,500 nautical miles. “We have been looking for just the right vessel to expand our shipboard operations.” said Prossin. Named after HMS Resolute, a former Royal Navy Arctic exploration ship, and also the Inuit town of Resolute in Canada’s Nunavut Territory, RCGS Resolute will arrive in Canada in November 2018 for its inaugural One Ocean polar voyage. RCGS Resolute will also carry the initials of the Royal Canadian Geographical Society, with which One Ocean partners in exclusive educational and environmental science programs, and expeditions in Canada’s north. Built in Rauma, Finland, in the same shipyard as the Akademik Ioffe and Akademik Sergey Vavilov, RCGS Resolute will also offer modern stabilisation and top ice class (Lloyds 1AS) compliant with the new Polar Code. RCGS Resolute began life as the Society Adventurer but never joined the now defunct Society Expeditions for whom it was ordered. In 1993, she was acquired by Hanseatic Tours, who renamed her Hanseatic, the fourth German-based ship of that name. 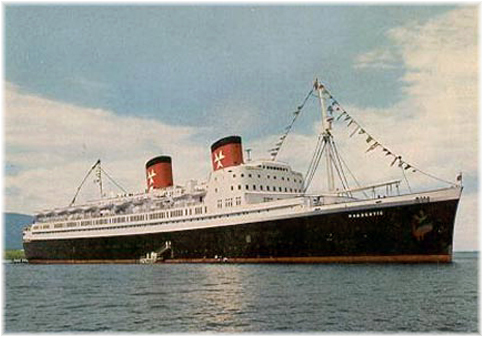 The first was a former Canadian Pacific ocean liner. The Hanseatic was then acquired in 1997 by Hapag-Lloyd Cruises, although she remained in Hanseatic colours for many more years, until 2011 in fact. 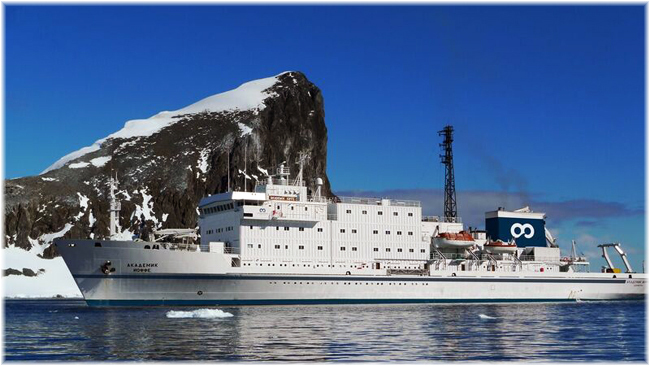 The Akademik Ioffe and Akademik Sergey Vavilov were completed about five years before the RCGS Resolute, and chartered regularly from 1992 onwards by companies such as US-based Quark Expeditions, Toronto-based Marine Expeditions, Melbourne-based Peregrine Adventures and now One Ocean Expeditions. 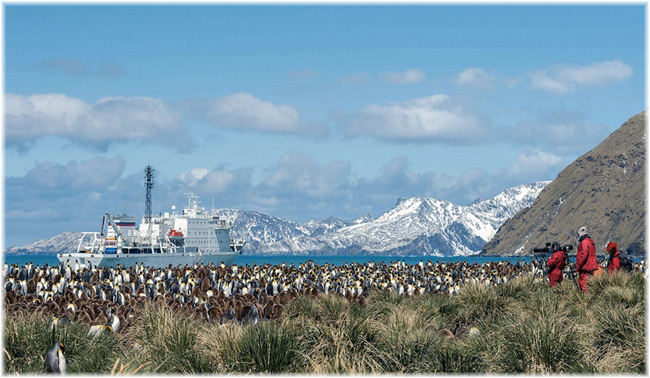 Prossin has accompanied these two ships on a career path that has taken him from being an expedition leader at Marine Expeditions in the 1990s through managing Peregrine Adventures’ marine-based expedition business to founding One Ocean Expedition ten years ago. With the RCGS Resolute set to join the fleet, One Ocean is offering an early booking incentive on Antarctic 2018-19 season voyages. A travel credit of US$1,500 will be allowed per person for October, November and March departures, and $1,000 for December, January and February departures. This offer is for new bookings only and expires on October 2, 2017. Wismar-based shipbuilder MV Werften has completed its first newbuilding, having on August 3 delivered Crystal Bach, the first of four new Rhine class river cruisers for Crystal River Cruises. Designed for European river cruising, the 443 x 37′ Crystal Bach will sail the Rhine, Danube and Main Rivers, accommodating up to 106 passengers in 55 large suites, all above water line with horizontal sliding windows. Crystal’s “Rhine” class river ships are the industry’s first and only all-balcony, all-suite river cruise vessels. Most public areas have floor to ceiling glass, providing a spectacular view. The Palm Court has a glass-domed ceiling, allowing passengers to see the sky during daylight and the moon and stars in the evening. The luxury river yacht offers its passengers personal butler service and a high crew-to-guest ratio. The ship also features three gourmet restaurants, a spacious spa and gym, a counter current swimming pool, piano bar and bistro. The Crystal Mahler will follow, to be delivered in a few weeks, and Crystal Debussy and Crystal Ravel, the third and fourth of this quartet, have been under construction at MV Werften since January, with delivery scheduled for early 2018. MV Werften’s program includes nine ships over the next five years. In addition to four river vessels, these will include three Crystal Endeavour class yachts for Crystal Yacht Expedition Cruises and two 204,000-ton Global class cruise ships for Genting Cruises. Thomson Cruises’ TUI Discovery is to be based at the Newcastle-upon-Tyne (Port of Tyne) from May 2018, marking the first time this particular ship has been based in the UK since her introduction to the fleet in the summer of 2016. 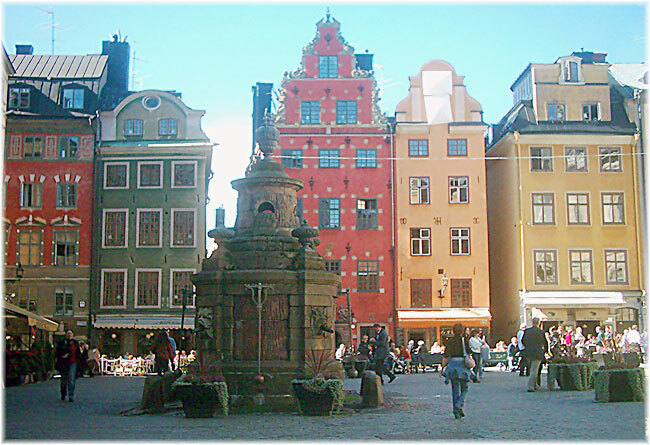 TUI Discovery will offer cruises to the Norwegian fjords and the Baltic, visiting cities such as Stockholm, Tallinn and Reykjavik. Passengers on the Baltic cruises will also enjoy an overnight onboard stay in St Petersburg. Thomson Holidays was founded in 1965 by Roy Thomson, later Lord Thomson of Fleet, and was owned by the Canadian-based Thomson Organization until 1998, when the business was floated on the UK market. 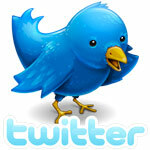 Thomson has been part of TUI Group since 2000. Thomson began offering cruises in the chartered vessels Ithaca and Calypso in 1973 but left the trade in 1977 because of high fuel prices. 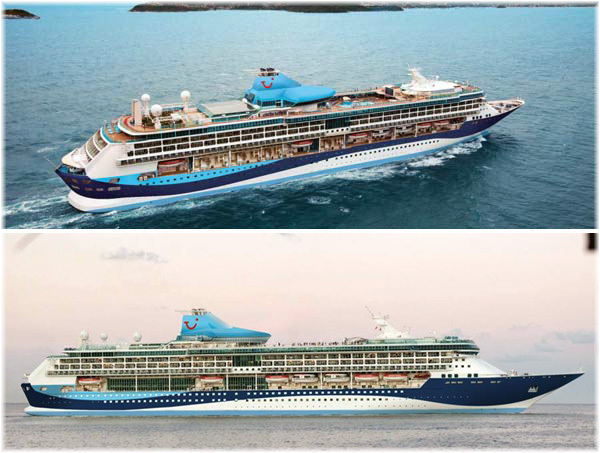 After an absence of twenty years, it re-entered the cruise market in 1996 and in addition to its popular fly/cruise product, has over the years operated cruises from UK ports such as Newcastle, Leith, Liverpool, and Harwich.